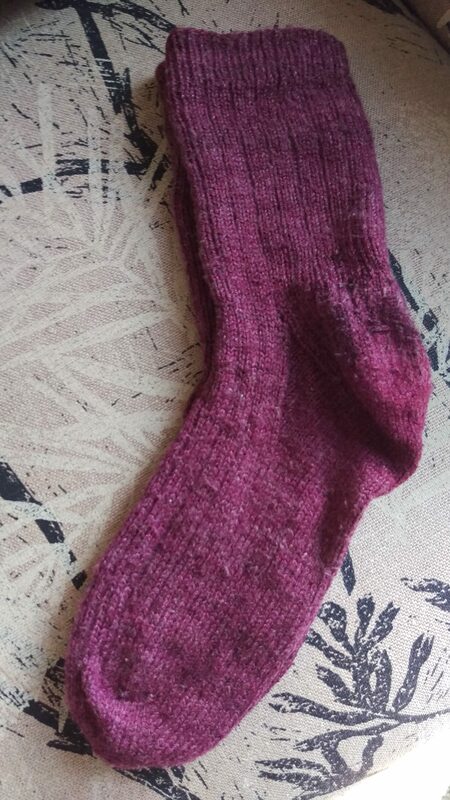 I thought one thing I could do to complete the feedback loop on the toughness or otherwise of my sock spinning would be to ask people I’ve given handspun socks to whether they could return them for inspection. One of the hard things about the fact that I–gasp–can no longer wear handknit socks, is that I don’t have the capacity to see and feel for myself how my handspinning fares in daily wear inside a shoe or boot. In return for people showing me how their socks have worn, I’m offering to mend socks that come back to me to close the feedback loop. 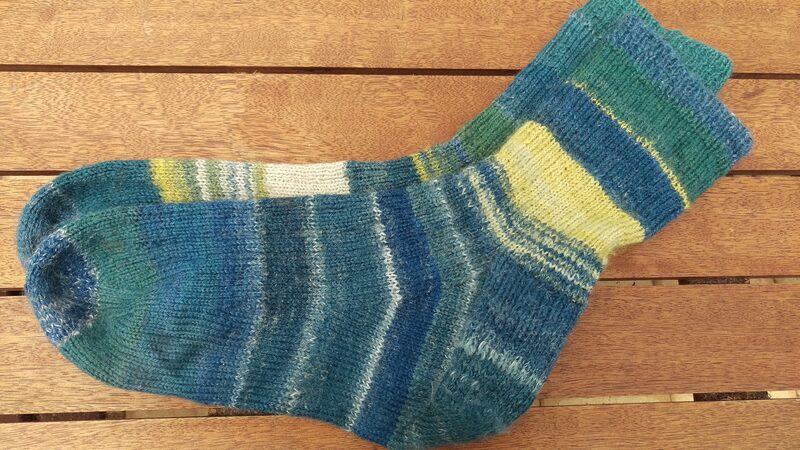 So if you happen to be reading this and you think you have a pair of handspun, handknit socks I gave you, bring them in and if they need darning, I’ll do the honours! I think it is worth considering the question of wear. It is a striking feature of most conversations I have with people about how hand knit items are wearing, that they feel they need to apologise if something I knit has worn out or worn through. I don’t think so. Sometimes it is obvious enough that the fault was with the spinning or knitting or fibre choice (so if anyone should apologise it should be me; or perhaps there could be shared acknowledgement of how wonderful the alpaca socks felt, but that they were never destined to last decades). On the whole, though, I tend to think that it is rather flattering that people like things I made enough to wear them until they fall apart. And unless I know what happened to them, sometimes I am not in a position to learn what might make me a better sock spinner (for example). Nylon is permanent, it will never biodegrade, and therefore we should think seriously before we use it. But the flip side of this recognition is awareness that socks without nylon will not wear as well as those with nylon. There is a reason it came into use in the context of socks. And–now that I have lived long enough to understand how a plastic bag will “degrade” into squillions of little bits of plastic, I think it may be time for a thoroughgoing recognition that when your #tuffsocksnaturally wear out they will biodegrade, so the compost or the worms can take them, especially if you dyed thoughtfully too. But I digress. This sock came home recently with only one hole! I made these socks a little over a year ago (follow the link for details), so they have not had a huge amount of wear. But the hole was quite big, and clearly resulted from the fabric wearing right through in a large area. 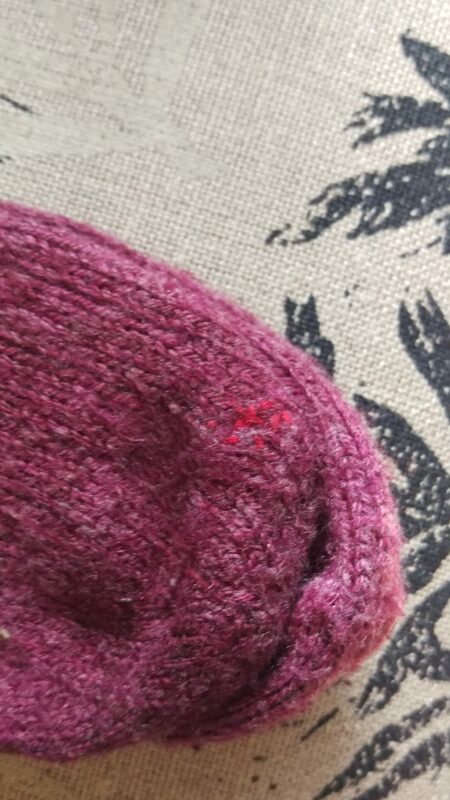 Given the fact that the other sock had not worn through in the same place, I’d say there was a weak patch in the fabric, likely caused in this case by the blending of the fibres (Suffolk, mohair and silk) being uneven, or by the spinning being on the thin side, or underplied. I decided on a knit-in patch rather than a darn. 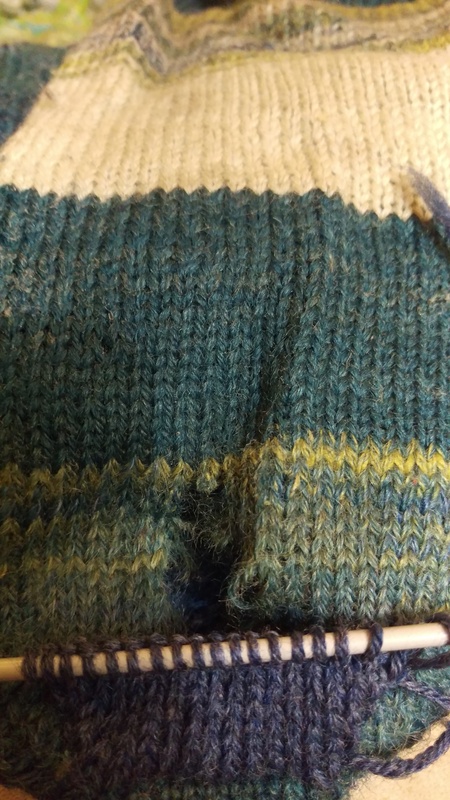 So I picked up stitches at the base of the heel flap (above) and began to knit, joining on by picking up a stitch on each side of the patch each row, and knitting it together with the edge stitch of the patched section. The under-heel section will be thicker than the surrounding fabric, and the patch is generous, but I think under the heel is about the least sensitive place to put a patch and clearly reinforcement is needed! Another pair of handspun and handknit socks came home the same day. These had two tiny, neat darns in red thread, a lovely application of visible mending (and I think I found the remainder of the skein in my stash subsequently, which may explain the yarn choice another way). One darn was up by the cuff, where it may have been a breach in the spinning or perhaps a munch from a m*th. The other is here on the toe, where wear is to be expected, in my view. All our feet (and shoes) are different, of course! I found the post about knitting these socks here. They were knit in 2014 and have gone from son to mother in their lifetimes thus far. And yest so little obvious wear?? I spun them from… Superwash Merino/Bamboo/Nylon blend. I bought it at a spinning workshop as the recommended blend for sock spinning, and did a class on spinning for socks. the other thing I note with interest is that I knit them on 2.75 mm needles. I think that was partly because the yarn was finer than I anticipated, but it dies also suggest a finer gauge than my usual, and that is another long-wearing-sock-strategy handed down through the ages. So–the combination of nylon content, tight gauge, machine prepared fibre and handspinning produced a higher wear sock–but not a nylon-free sock, and let’s not pretend that industrially produced bamboo fibre is kind to the environment–though I do assume it would biodegrade at least. So there you have it! My first two worked examples of handspun handknit socks in wear for review. What are you learning from reviewing your spinning and knitting?